In less than a year, DC Comics fans are going to get to see the Justice League unite for the first time ever in live-action. There is some hesitation after the mixed reaction to Batman V. Superman: Dawn of Justice, but the marketing materials released by Warner Bros. so far have given fans hope. Now, we have another new image to get us amped for what is an important and hopefully great superhero movie. The new image comes courtesy of Entertainment Weekly and doesn't unite the entire Justice League, but it does feature a few key members. 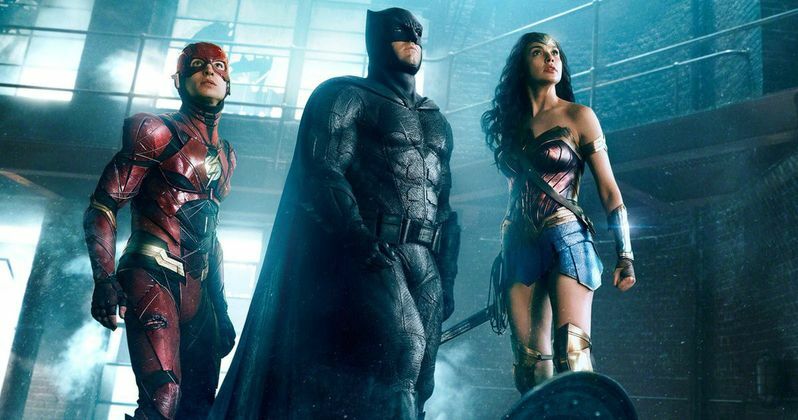 The picture features Batman (Ben Affleck}, Wonder Woman (Gal Gadot) and The Flash (Ezra Miller) as the New Trinity, with Superman still buried six feet underground. Director Zack Snyder is in the middle of editing the movie, but gave a brief comment to EW about it. Here is what he had to say. "I'm super happy with the chemistry of my league of justice doers." Chemistry will be crucial in Justice League since the various members will be working with one another to save the world from Steppenwolf, who will be the main villain this time around. In the teaser that was released over the summer at San Diego Comic-Con, we have already seen that Bruce Wayne and Barry Allen have some pretty good onscreen chemistry. EW also spoke briefly to star Ezra Miller, who offered some insight about how The Flash fits into the fold as a member of the Justice League. Here is what he had to say. "Flash is Ringo Starr. He annoys everybody, but he doesn't have any specific beef with anyone. Uncle Fish Curry [Aquaman] is very grumpy. Dad [Batman] gets grumpy too. (He's had a long life of fighting crime.) ­Wonder Woman is very considerate, so even though she's annoyed with the Flash, she's still very compassionate." In addition to the new photo from Justice League, Warner Bros. also released a brand new image from the upcoming Wonder Woman movie (via Time), which will actully preceed Justice League by a handful of months, making it crucial. Also, it will be the first female-led superhero movie of the modern era, putting that much more weight on its shoulders. The photo shows Diana Prince riding into war on horseback. Chris Pine as Steve Trevor can also be seen in the background of the photo. Director Patty Jenkins spoke with Time a bit about the movie, saying she was influenced by the original Superman and that she was applying the same tropes to Wonder Woman as are applied to male superheroes. Here is what she had to say. "We've spent years treating male heroes in certain ways. I just applied those same tropes to her, and all these incredible radical moments suddenly appear to an audience." Warner Bros. is totally committed to making the DC Extended Universe work, critics be damned. But they can't keep making movies that get trashed by critics and are met with a divisive response from fans and expect to keep having excellent results at the box office. That being the case, Wonder Woman and Justice League really need to deliver next year in order to help keep the DCEU train on the tracks. While we wait for the new Justice League trailer and for Wonder Woman to be released, you can check out these new images below to help tide you over. Wonder Woman is set for release on June 2, 2017, with Justice League set to follow on November 17, 2017.